Frank Dunnigan was born during the baby boom years of the 1950s to a family that first settled in San Francisco in 1860. He graduated from St. Ignatius College Prep and the University of San Francisco. He is a recent retiree after working in downtown San Francisco for several decades. 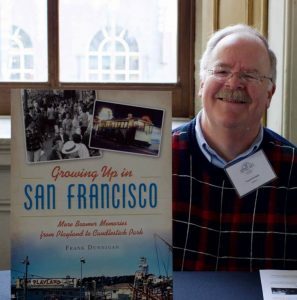 He is the author of San Francisco’s St. Cecilia Parish: A History; Growing Up in San Francisco’s Western Neighborhoods:Boomer Memories From Kezar Stadium to Zim’s Hamburgers; and Growing Up in San Francisco: More Boomer Memories from Playland to Candlestick Park (The History Press, 2016). Newcomers and visitors can still enjoy iconic San Francisco with activities like riding a cable car or taking in the view from Twin Peaks. But San Franciscans reminisce about seafood dinners at A. Sabella’s on Fisherman’s Wharf, the enormous Christmas tree at Union Square’s City of Paris department store, plus the arcade games, cotton and carnival-type rides at Playland-at-the-Beach. In the second volume of unforgettable stories, local author and historian Frank Dunnigan recalls the many details that made life special in the City by the Bay for generations.